NMake2MsBuild is shipped with the new WDK and is typically found in your %SYSTEMROOT%\Program Files\Windows Kits\8.0\bin\[x86,amd64] directory. Run this command from the directory that contains the “Sources.” or “Dirs” file that you want to convert. · Sources or Dirs indicates what is to be converted (i.e. a project that has a “Sources.” file or a project that contains a “DIRS.” file. · Arm – adds ARM as a valid target CPU architecture to the project’s build configurations. 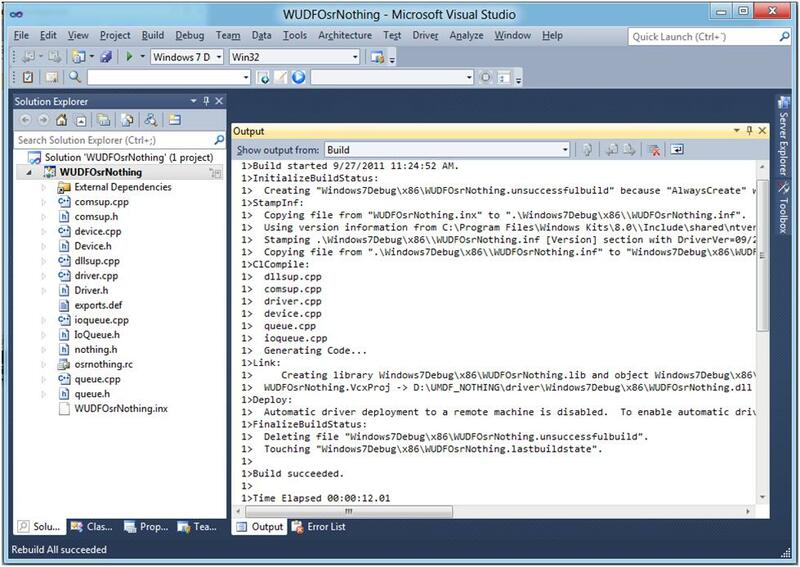 The generated project will still require that the installed build environment and WDK support targeting ARM. When you convert a project, NMake2MsBuild will attemptto create a “.vcxproj” project file that you can use to build your driver in the new build environment. When we say “attempt” we mean the conversion utility will do its best to perform the conversion. Most of the time, and certainly for any simple projects we’ve tried, the conversion is performed without a hitch. Unfortunately there will also be times when NMake2MSBuild will not be able to perform the conversion. For example, here at OSR we have projects that been around since NT 4 and we have been hacking, whacking, and patching our sources files to keep the projects building with each subsequent release of newer WDKs. As a result of this “evolution”, these old sources files have a lot of crufty and unused things that NMake2MsBuild doesn’t like. That shouldn’t be very surprising. In fact, it’s more surprising that some of these old files worked with Build at all. So unfortunately for us, we’re probably going to have to create new projects from scratch. Oh well, it was probably time to clean up all the old junk anyway. 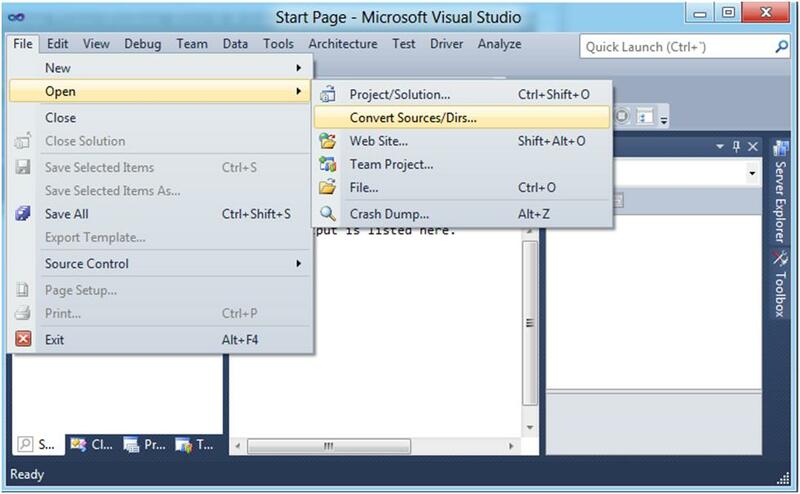 From within Visual Studio, we use the “Convert Sources/Dirs” option and get the results shown in Figure 4below. Notice that we have a small log written to the Output pane describing how the conversion went (truncated to save space), a more detailed log (NMake2MsBuild_Sources.Log) was written out during this conversion and is stored in the directory being converted. 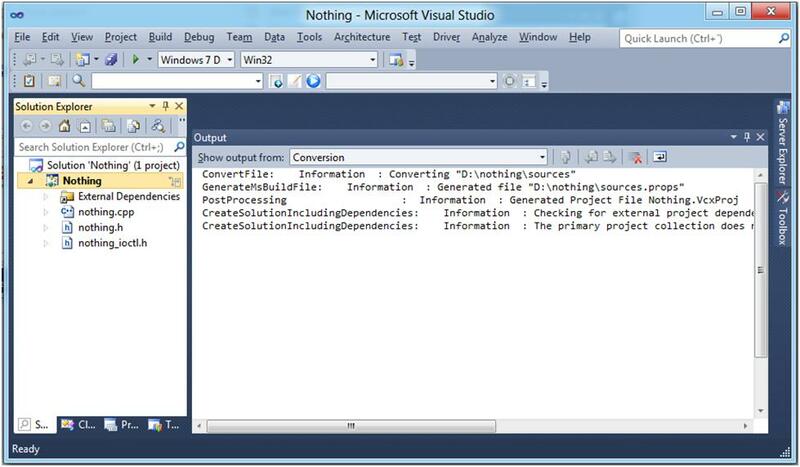 In addition you will see that the files of our example “Nothing” project are now visible in the Solutions Explorer window. For our next conversion we will convert a UMDF driver from the Win7 WDK to a “.vcxproj” based project. The sources file for this project is shown in Figure 5. 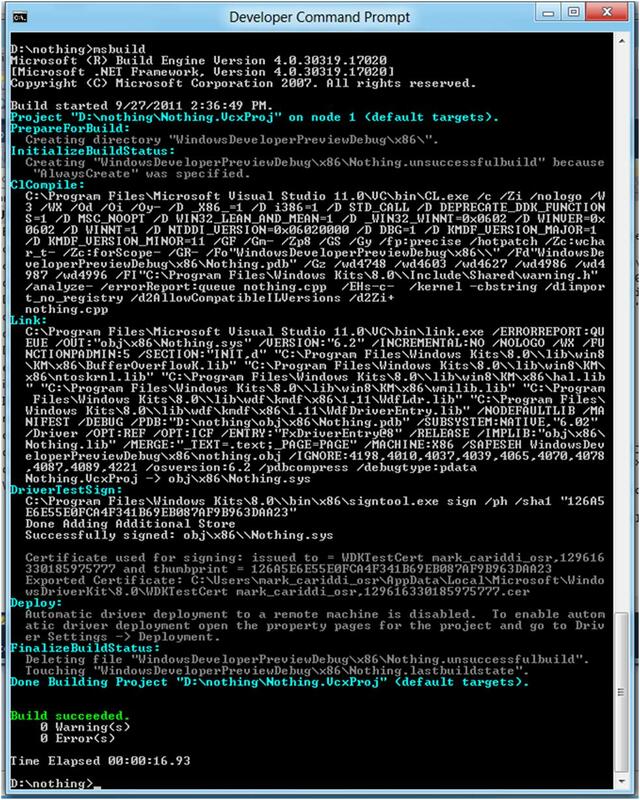 · The project has a custom build step (NTTARGETFILE1) which requires a makefile.inc file shown in Figure 6.